ummm i have over 6k+ battles...i think i know what to do when i bounce. However, these "canons" are so poor they struggle to penetrate ANYWHERE. Yes cannons are piece of junk but there are few weakspots. Try to hit back of the turret. You can penetrate it. Aiming at sides has no effect - penetration for 0 dmg in 90% of shots. AMX38 can penetrate other AMX38s if you know where to fire. I fired at a box on the AMX38's back and i could penetrate 3/4 times. Killed it from 50%, mind you it was facing me side on, but you should be able to drive side by side and hit one of those boxes on the back of the tank. Yep, AMX 38s can penetrate each other. But you have to get pretty close. And tell me how can I do that when there's at least one T4 or T5 tank nearby. When KV or SU-85 or whoever else spots me, they always try to kill me first, because I'm an easy kill (often one-shotted or two-shotted). The only viable strategy for this tank in high tier battles is hiding behind team-mates and hope opportunity shows itself. Most of the time it doesn't. Of course, it's wholly different situation when you're the top tank. In battles like this I play like T95, breaking through enemy lines, drawing fire, while my team-mates destory tanks with accurate fire. Easily the most dreaful tank in the game, for me. I thought the stock Tiger 1 was bad but at least pre release, when I had one, the HE could do a little damage, the AMX 38 does naff all to pretty much anything. I'll try to hit the enemy weak spots in future but honestly, WHY does it have to be so crucial to hit the right spot to do damage? it's a game and as such should be fun! I must say though, that the bouncing crap is quite ridiculous on most tanks right now (can't talk about tier 8 and higher as I don't have any). Any tips on play style? Don't buy the stuff you research. You'll get thrown in with bigger boys and the grind will be awfully painful. The tank is horrible. Extremely slow, and you can't penetrate anyone. If you're not the top tank, you're totally useless. If you are the top tank, you're good as a punching bag. The only problem is that this means you're only good when you're able to attract the attention of the enemy team. Unfortunately, the nature of random batles is such that they don't listen and go berserk like headless chicken most of the time, so your effort is wasted. And if someone is moderately experienced they can simply ignore you and kill everyone else. I thought up a joke to make the grind easier. Two AMX 38 meet on the battlefield. I need help getting victories with this tank, so if anyone experienced is up for platooning let me know. You can pick anything that leads to victory, I'll take this tank. I knew that AMX-38 IS slow as hell. So every French tanks are underpowered, undergunned, undermanned and heavily armored. And people complain about speed... imbécile! Killing B1 and such is not that hard. Just hit the driver's view port and he goes "WHAT THE HELL?" and tries to run away. AMX 38 is the worst piece of crap I have ever played. Slow turret, gun that can't penetrate anything, max. 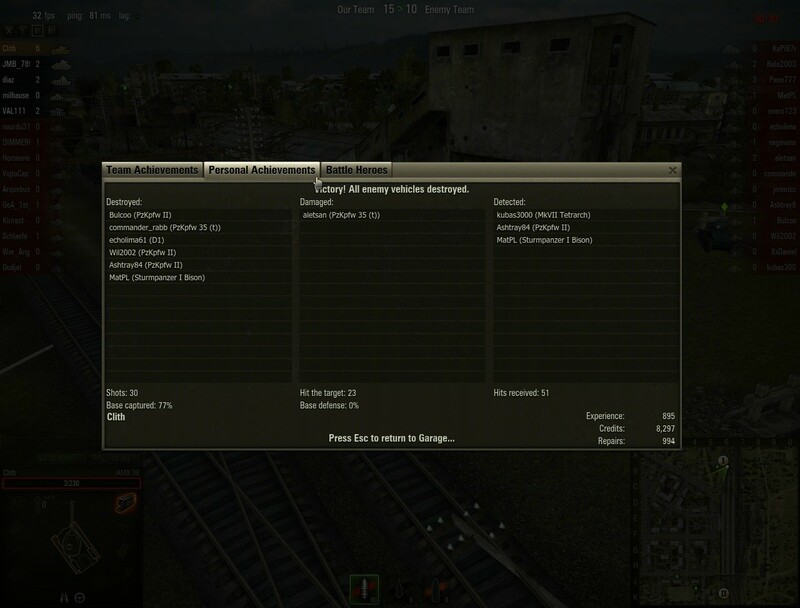 speed 15km/h, can be easily killed by higher tier tanks and outmaneuvered by lower tiers... I think that everything else has been already mentioned.